The Character of Consciousness (Philosophy of Mind) - Jon Lieff, M.D. David Chalmers is the philosopher who first used the term “the hard problem” to describe the problem of explaining subjective experience. He also coined the term the “extended mind”. 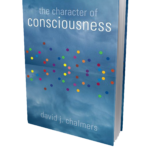 This book is an updated version of his book from 1996 The Conscious Mind, In Search of a fundamental theory. As a philosopher, not strictly a neuroscientist, he is able to discuss non-reductionist, non-materialist views without losing his vocation. Chalmers is not convinced neural correlates will explain consciousness. His theories incorporate the connection of information in the physical universe and the human mind, with the possibility that consciousness is a property of the universe.